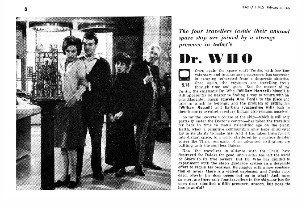 An article recently published in the Doctor Who Appreciation Society's magazine, Celestial Toyroom, issue 371, as part of a tribute to Verity Lambert and here reproduced for your delight and edification. Once again, thanks to Tony Jordan for the encouragement and publishing this material. (c) 2009 Frank Collins. If you wish to quote from this article please ask the author's permission. The Edge Of Destruction is often seen as the runt of the litter amongst the pedigree stories of that first season of Doctor Who. 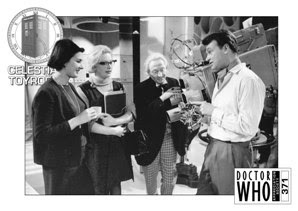 It is cited that these two episodes were both written as a filler between The Daleks and Marco Polo simply because the production team needed more time to get the latter serial ready and were offered as a conclusion to the original commissioned run of 13 episodes. Either way, the requirements were simple – no other standing sets apart from the TARDIS and no other supporting cast were to be employed. The writer David Whitaker, also the series’ script editor at the time, was charged with creating a suitable story to bridge the gap. It’s this notion of using the only available resources to create two episodes that both damns the story and, actually, redeems it amongst fans. It’s either the ‘boring one’ after The Daleks or ‘the weird one’ before Marco Polo depending on your disposition. Putting those prejudices aside, The Edge Of Destruction is, very quietly, an unsung masterpiece sitting within the brouhaha of the competing stories in that first year. Whitaker uses the two episodes as an opportunity to forensically examine the main characters and how they interact, to define and then refine their psychological profiles whilst also embracing themes and ideas that the previous 11 episodes had already touched upon; the decline of Empire, the changing roles of men and women in a society that was thawing from the rigid societal strictures of the Second World War; the advent of the nuclear age and the technological ‘white heat’ of the 1950s and 1960s. As well as these contemporary mores, he also swiftly looks back over his shoulder and positions the two episodes within much older traditions; the inextricable link between female sexuality and the Gothic; the aesthetics of the Surrealist movement and the satiric comedy-tragedies of Pirandello. With the narrative confined to one set, the TARDIS, and the four leading characters of the Doctor, Susan, Ian and Barbara, what immediately strikes the viewer is the very dislocated, often disturbing, way that dialogue and, by extension, the story is delivered and performed throughout, especially during the first ten minutes of the first episode. All of the TARDIS crew seem have suffered a trauma and are unaware of quite who they are and where they are, particularly in relation to each other. The actors are performing in a very theatrical style in an exaggerated environment and, at least in the beginning of the story, are acting completely out of character in order to find their characters. This deliberate mode of expression not only positions the programme within the early traditions of televised drama, where plays were performed live and televised within a facsimile of the theatre’s proscenium arch, but also echoes the meta-theatre of Pirandello’s Six Characters In Search Of An Author. The play, first performed in 1921, is a commentary on the nature of theatricality, ‘drawing attention to the literal circumstances of its own production, such as the presence of the audience or the fact that the actors are actors, and/or the making explicit of the literary artifice behind the production’. The use of this device, both in Pirandello and in The Edge Of Destruction to an extent, is to ‘de-stabilise realism, to use theatrical tropes to challenge the narrative’s pretension to be real and in doing so call attention to the strangeness, artificiality, illusoriness or arbitrariness’ of the lives we live vicariously through the Doctor, Ian, Barbara and Susan. And Doctor Who has always had an antagonistic relationship between the real and the unreal, the extraordinary and the ordinary. This is simply the series’ own traditions manifesting themselves as the driving force of the narrative. The Edge Of Destruction is almost an in-joke on the series itself because, in the end, a faulty switch on the TARDIS console predicates the entire psychodrama where the lead characters internally define their relationships to each other. The unstable time machine is commenting upon itself, upon the artificiality of television production, and, in this respect, the TARDIS almost behaves like the Manager in Pirandello’s play. It is the agency by which the characters tell their story, enact their play within a play, and reveal their inner-psychological states. An interesting, and rather undervalued, aspect of The Edge Of Destruction is its placement within the tradition of the Gothic. The mistake that many fans of the series make is to attribute and confine the use of the Gothic in the series to the Hinchcliffe era alone. Received opinion is that the romantic Gothic, as exemplified by Hammer horror films of the late 1950s and 1960s, became an influence on the series at that point. When looking at the Gothic in the context of the series in 1964, the blood and thunder of the then contemporary horror revival undertaken by Hammer isn’t the point of reference. When The Edge Of Destruction was transmitted, the output of Hammer was at its zenith but the Gothic tradition within these Doctor Who episodes not only reflects the psychological and supernatural disturbances as depicted in films like Robert Wise’s The Haunting or Jack Cardiff’s The Innocents, both released before the first Doctor Who story was ever transmitted, but also another post-war film that’s important to bear in mind, Anatole Litvak’s The Snake Pit which was one of the first Hollywood films to seriously depict mental illness and the institutions set up to deal with them. These films key into an aspect of Gothic horror that The Edge Of Destruction and The Brink Of Disaster flirt and, eventually, subtly resonate with. 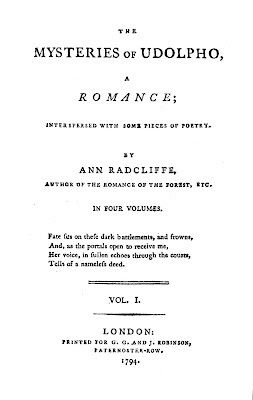 It is a contemporary Gothic that concerns itself with female subjects and subjectivity but that is weighted with signifiers of hysteria or ‘the madwoman in the attic’ theme rooted in Ann Radcliffe’s The Mysteries Of Udolpho, often cited as a major influence on the Gothic tradition. Susan is codified at the beginning of the series as an adolescent. She has no permanent home and the only domestic space she inhabits is the TARDIS. 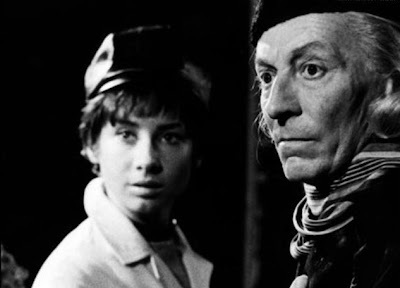 She is dominated by the father/grandfather figure of the Doctor and as of An Unearthly Child she must vie for his attention in competition with two other adults, Ian and Barbara. Is it analysing this too much to suggest she is the product of a broken home with an antipathetic relationship to parental figures? 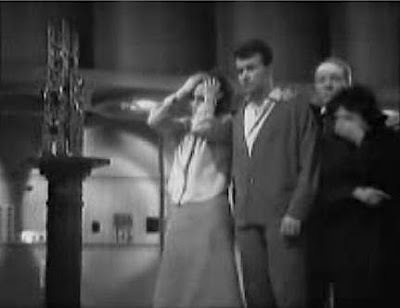 Many fans tend to dismiss Susan as an underdeveloped character, often prone to fits of annoying hysterics, betraying a figure that is weak and immature but that immaturity, I would argue, is precisely the point of the character’s struggle for development from the Pilot Episode through to The Dalek Invasion Of Earth. The Doctor himself recognises this and deliberately removes her from her domestic space and places her into the environs of a post-invasion Earth. Susan’s story is one that takes her from a naïve, psychologically contradicted immature teenager, to a sexually aware woman whose dependency has shifted to a younger, male figure and, whilst this may not be particularly well written or defined overall, there are moments when these themes do move to the surface of the drama. This is one of the main narrative arcs that the character embarks upon that is very rarely examined. It is the classic scenario of ‘a fledging leaving the nest’ and parents, in the 1950s and 1960s, would expect a maturing teenager to find employment, earn their keep, eventually leave the home and arrive at a state of independence. Susan reflects this back to the audience. The Edge Of Destruction is often seen as Whitaker’s attempt to resolve many of the conflicts in the four leading characters, through a rites of passage scenario, and to reposition them, taking them from being a disparate group of reluctant travellers to grudgingly accepting their status as a mutually trusting 'family'. 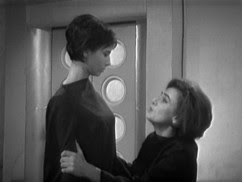 This rites of passage scenario includes conflict between the Doctor and Barbara, in a very powerful scene for Jacqueline Hill, mistrust between Ian, Barbara and the Doctor and, crucially, throwing Susan into conflict with herself, the other adults, and her environment. This reaches an apotheosis in the sequence where Susan threatens Barbara and Ian with a pair of scissors. I loved this story. I think the lenghth it ran for helped as well. Much better than Midnight as well, which was kind of similar to this.